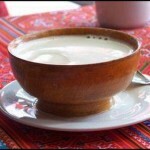 In China, the most commonly enjoyed tea is definitely green tea. Greens are easy to process, easy to store, and easy to brew – and they have the added benefits of tasting good and improving your health. 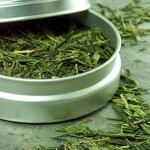 Green tea is grown all across southern China, from the foothills of the Himalayas to the coastal mountains of Taiwan. You can find large, bitter, relatively unprocessed greens in villages and towns across the region as well as the single emerald leaves picked according to a thousand-year tradition from a thousand-year old bush selling for thousands of dollars a pound. Greens are a good base for blends with flowers like jasmine, chrysanthemum and osmanthus. 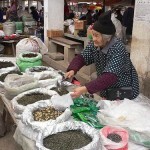 A hardy maofeng tea – inexpensive but still a good green with all of the catechins and antioxidants that all green teas possess to some degree or another – is a classic base for blends. Most blends in Asia are simple concoctions of a mid-grade green with flowers or some medicinal herbs. 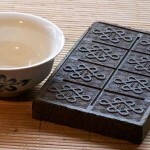 The diverse blends that are popular in the US have not yet caught on in Asia. 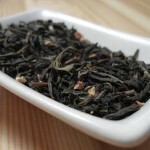 Asians tend to prize the purity and simplicity of greens (and all teas for that matter), so they eschew complex blends. One good reason is that the more complex and strong-flavored the blend, the lower quality the base, especially if the base is a green. 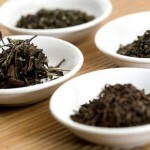 This comes back to the “law of tea quality” that the younger the leaf, the better the tea. 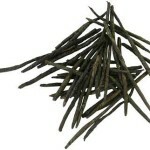 Most bases are older, hardier more flavorful leaves. (This law has exceptions, which we will discuss in later posts). So if your green tastes a bit like fresh grass or smells like the morning after a rain, then you are dealing with a decent tea. If the leaves stand up in your glass and have a light green emerald color and look like slivers of jade, then that is also a very decent green tea. And if the water of that tea is almost transparent, but gives everything you look at through it a golden, olive-green tint, then that is a fine tea. And lastly, if you see tiny bits of what look like dust motes floating in that clear, slightly greenish brew, then that, my friends, is a great tea. Because that particular green has been processed so carefully that it retains some of the fuzzy hairs that white teas are famous for. Greens are just one step above whites on the processing hierarchy. Greens are roasted once or twice and allowed to oxidize slightly before being threshed, packed and stored in a cooler until consumption. 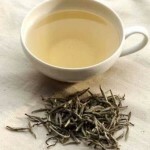 In China, green tea is brewed in glass or porcelain. 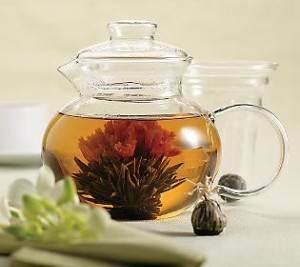 Most people don’t use pots for greens, instead brewing the greens in a Gaiwan cup or in a tall, square glass. The Gaiwan is a classic way to drink tea and the tall glasses allow one to see the “jade slivers” floating and – if the tea is exceptional – to view your friend through the brew and count the dust motes. Not many people use pots for green tea. Not that it isn’t possible, it just takes a bit of skill and messing up means a bitter tea. Greens are temperamental. Not delicate like whites, but temperamental, which means that a bit too much hot water burns the leaf and you have yourself a bitter green that dies quick, and if the water is too cool, then you’ll have a green that doesn’t open up properly and remains a wet, hard mass with no flavor. My way of brewing is to pour a little cool water into my glass or Gaiwan filled with green tea leaves and after maybe 2 seconds at the most, let in a gush of hot water (90 degrees). This works for me. The green is “prepared” for the hot water before it hits and opens up nice without any bitterness. Younger leaves need a little more of this type of attention, whereas older hardier, darker leaves can take the heat right off the bat and sometimes need it in order to open up. Every kind of tea has its own perfect brewing method; experiment a little and you’ll surely come across the right one for your tea.